You may have seen many red-flowered Rudbeckia cultivars in the commercial gardens where you live but the likelyhood is that all of these would have all been propagated vegetatively. This means that they are expensive to purchase should you chose to have these more fancy varieties on your garden. 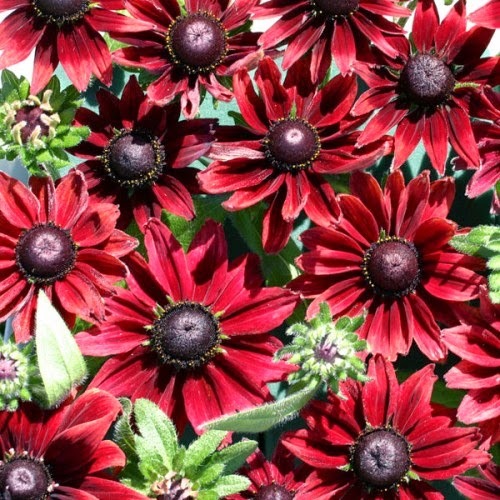 However the clever plant breeders have been at it again and have produced the absolutely gorgeous Rudbeckia hirta 'Cherry Brandy', the first ever red Rudbeckia that will grow true from seed! These robust plants have outstanding garden performance, producing a mass of attractive, cherry-coloured blooms throughout the summer. Furthermore, they are tolerant to both heat and drought, as well as being able to cope with poor soils! 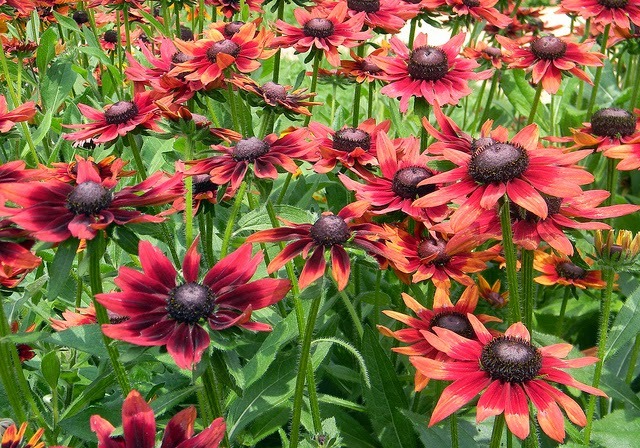 Rudbeckia hirta 'Cherry Brandy' is now available for sale from the 'Seeds of Eaden' seed shop. Rudbeckia hirta 'Cherry Brandy' will require and open and sunny site, and will grow quite happily in any cultivated and well-drained garden soil. On dry soils mulch with well-rotted compost or far manures in the spring. They will grow between 12 and 18 inches tall, and while they will tolerate exposed conditions you may find that they will require staking if you are prone to strong winds. Cut back hard after its first flowering and then provide a liquid soluble fertilizer to help promote a second flush of blooms. Deadhead flowers are they begin to fade and cut the stems to the base in November. Over winter protect the crowns of the plant with a dry mulch of sand, ashes, straw or bracken.